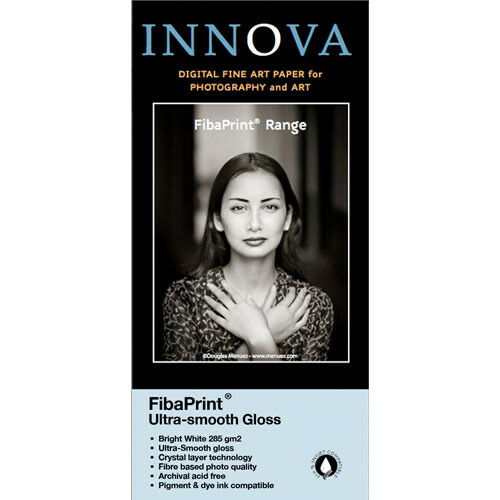 Using a crystal layer technology and optical brighteners, this bright white FibaPrint Ultra Smooth Gloss Paper from Innova is able to achieve a look similar to that of darkroom papers. Available here as a 25-pack of 8.5 x 11" sheets, this paper features an alpha cellulose base with an ultra smooth gloss finish. It also has a weight of 285 gsm and a thickness of 11.2 mil for a premium feel as well as a rated brightness of 111% and a whiteness of 152%. Additionally, it is acid and lignin free for longevity and it is instant drying. Box Dimensions (LxWxH) 11.5 x 8.9 x 0.7"